Developed the “Crane Camera Image Detection System” | TOYO CONSTRUCTION CO., LTD.
Toyo Construction Co., Ltd. (President: Kyoji Takezawa) has recently developed a “Crane Camera Image Detection System” which utilizes crane camera movie images. This system has a crane camera installed at the tip of the crane boom and workers can be detected from the camera movie images by image recognition technology, and the crane operator is notified when a worker gets close to the suspended loads. During crane operation, the operator performs operations such as lifting and hanging loads according to instructions of the signaling person. But depending on the environment of the work place, the crane operator cannot visually check the hanging location directly. The use of crane cameras is effective because they can be viewed through a TV monitor during work at places where the crane operator cannot see. On the other hand, since it is an image from the upper side of a suspended load, people tend to be seen smaller and there is a possibility that the operator’s attention may focus on suspended loads and installation locations and that the recognition of people will be delayed. By registering the model (color) of the object, this system can detect and track multiple numbers of workers at the same time. 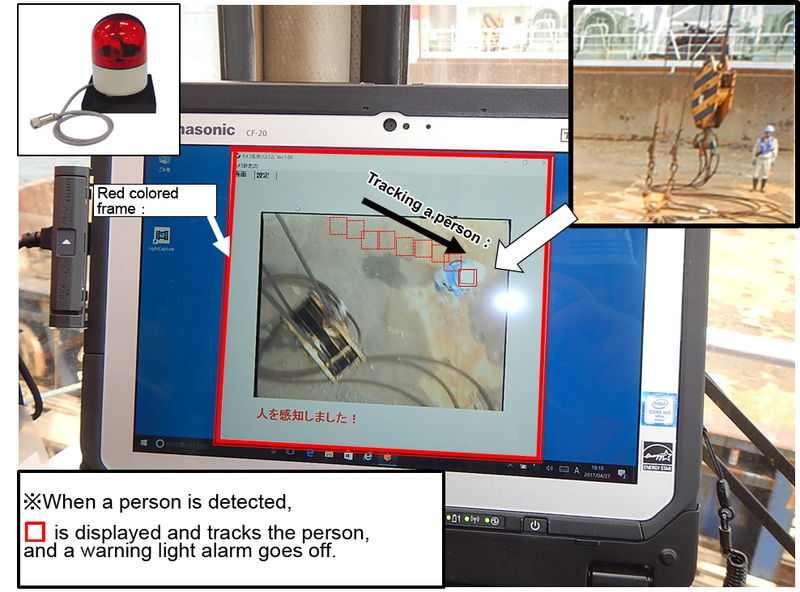 When it detects a worker that has intruded into the set area, a red colored frame is displayed on the monitor, a warning light is lit, and the danger is reported to the crane operator. Because it is possible to detect workers even if the camera installation position, orientation and focal length are changed, a safe crane operation is possible more than ever. We will continue to make use of technologies such as ICT and AI to strive to develop technologies that contribute to improving work efficiency, productivity and safety management. For inquiries, please contact: Toyo Construction., Co., Ltd.